Paisano Publications Blog – Page 128 – Up to the minute ScuttleButt from your pals at Easyriders. If it’s of interest to bikers, we’ll post it here! Up to the minute ScuttleButt from your pals at Easyriders. If it’s of interest to bikers, we’ll post it here! MINNEAPOLIS, Minn. —July 30, 2014; Hot on the heels of the exciting reveal of the new Indian Roadmaster luxury touring motorcycle, is the announcement of additional activities and motorcycling celebrities participating in Indian motorcycle activities at the 74th annual Sturgis Motorcycle Rally. The new Indian Roadmaster will be a featured demo ride motorcycle in the demo fleet located at Exit 30 of Interstate 90 in Sturgis. In addition the full palate of 2015 two-tone, Chief Classic, Chief Vintage and Chieftain motorcycles will be available for demo rides. Roland Sands has built a stunning custom motorcycle that will be reveal on stage at the Buffalo Chip between concert on Sunday August 3rd (appx 9:30-10:30 pm). Roland is keeping details close to the vest – but offers a tantalizing peek at the completed bike. The Indian Motorcycle display at 3rd and Lazelle will feature a complete display of the new models including apparel and accessory displays and will host the American Motordrome that features vintage Indian 101 Scouts and is the most authentic “Wall of Death” show on tour. Daily shows will thrill audiences as they have done for decades as the vintage motorcycles defy gravity and deliver heart-stopping performances. MINNEAPOLIS, Minn. — July 27, 2014 — Indian Motorcycle, America’s first motorcycle company, is proud to announce the all-new 2015 Indian Roadmaster, setting a new benchmark as the ultimate in luxury motorcycle touring. Revealed at the annual Indian Motorcycle dealer meeting, this exceptional new addition to the Indian Motorcycle family will make its public debut on August 2 at the 74th annual Sturgis Motorcycle Rally and will be available for demo rides throughout the weeklong event along with the rest of the 2015 Indian Motorcycle lineup. More announcements regarding the 2015 line of Indian bikes will also be made on August 2. Originally produced from 1947-1953, the Indian Roadmaster was widely recognized as one of America’s most reliable and comfortable touring bikes, and the all-new 2015 Roadmaster is destined to reclaim that honor. In keeping with its legendary namesake, the Roadmaster comes loaded with premium features for comfort, convenience and luxury, including expansive storage capacity and unmatched power and performance. Indian Motorcycle’s new flagship luxury touring bike is powered by the awe-inspiring and proven Thunder Stroke 111 engine, a 49-degree, air-cooled V-twin power plant mated to a 6-speed overdrive transmission. The Roadmaster is dripping in standard chrome, including the forks, trim, trunk rack, front and rear highway bars, fender tips, and many other chrome components that are options on other brands. The 2015 Indian Roadmaster is available at a starting US MSRP of $26,999 with expected delivery in dealerships across North American in September. It is available in Thunder Black, Indian Motorcycle Red, and a two-tone Indian Motorcycle Red/Ivory Cream paint scheme. Sturgis Rally attendees can experience the Roadmaster by visiting the Indian Motorcycle exhibit at 3rd & Lazelle St., or taking a demo ride at the Indian Motorcycle Demo Experience, I-90 @ Exit 30. Visit the Indian Motorcycle Sturgis event page for details. Victory Motorcycles has packed the Sturgis Motorcycle Rally schedule with special events, with a major focus on activities exclusively for Victory owners attending the legendary Black Hills rally. Victory’s Sturgis action includes the annual Victory Owners Ride and Party, celebrity meet-and-greets, military salutes, free 2015 Victory demo rides at three different locations, and the chance to win a spectacular Cory Ness Cross Country custom and matching guitar. Activities are planned in and around the Sturgis area from Saturday, Aug. 2 through Saturday, Aug. 9. FREE 2015 Victory Demo Rides – Now in 3 Locations! Victory has expanded its demos with two new locations to make it easier than ever to take free demo rides on the new 2015 Victory models. Along with the familiar location at Hersrud’s of Sturgis, Victory has added demo ride sites at the Buffalo Chip CrossRoads and at Rice Victory in Rapid City. It’s kickstands up for each day’s first ride at 9 a.m., and each day’s final ride rolls out at 4:30 p.m. All riders must be at least 18 years of age, show a valid motorcycle endorsement and wear a helmet and appropriate riding attire. Rice Victory is located at 301 Cambell St., Rapid City, SD 57701. Take Exit 60 off I-90. Plan to spend a lot of time, on multiple days, at the new Victory Performance Garage, the hub of action in the heart of downtown Sturgis. Register on-site and get a wristband that serves as your registration in a drawing for a special new 2015 Victory bagger. Get the wristband scanned at various display stations within Victory’s downtown location and you qualify for equipment upgrades to the grand prize bike. Meet & Greet world-renowned custom builder Rick Fairless, Aug. 2, 11 a.m.-1 p.m. Tribute Tuesday with special gifts for first responders and military personnel and veterans, Aug. 5, 9 a.m.-5 p.m.
Autograph sessions featuring “Gunny,” R. Lee Ermey, Aug. 5, 11 a.m.-1 p.m. and 3-5 p.m. Win It Wednesday with special prize give-aways every hour, Aug. 6, 9 a.m.-5 p.m.
Meet the legendary Arlen Ness family at a meet-and-greet on Tuesday, Aug. 5, 1 – 3 p.m. Check in at 9 a.m.; Kickstands up at 10 a.m.
Riders will check in and start the ride at the EagleRider display in the Buffalo Chip CrossRoads. Ride starts at 3:30 pm. ; Party runs 5:30-8 p.m. These special events exclusively for Victory riders feature a self-guided ride from The Lodge in Deadwood to the Sturgis Buffalo Chip®, where the annual Victory Owners Party will be held. Victory Owners Ride: Victory riders can check in at The Lodge in Deadwood from 2-3:30 p.m. Victory representatives will welcome riders at 3 p.m., take a group photo, then ride to the party with kickstands up at 3:30 p.m. Victory Owners Party: This annual gathering of the Victory family of riders will feature prize give-aways, presentations from Victory officials, great food, and live entertainment. Among the prizes: Two Victory owners will be selected as finalists for that evening’s Sturgis Rider Sweepstakes grand prize drawing. The finalists will appear onstage during that night’s Buffalo Chip concert, where the winner’s name will be drawn for the Cross Country 8-Ball customized by Cory Ness – with a matching Les Paul Studio Epiphone guitar. Register online for your chance to win the Sturgis Rider Sweepstakes. No purchase necessary. When this year’s LA Calendar Bike Show, now in its 23rd year, happened on a golf course in beautiful Malibu, CA, on July 20, a couple of Easyriders editors went to check it out. Known for bringing out beautiful women, awesome motorcycles, and an eclectic – and mostly two-wheeled – crowd, this year’s show didn’t disappoint. Though small in size, it was big in everything else. To find out more, be sure to check out Easyriders No. 500, our big Special Edition. Get it at your local newsstand or check it out online. Explore a beautiful and though-provoking display of motorcycles and related art during the Sturgis Rally at the Buffalo Chip’s 2014 Motorcycles as Art Exhibition. This year’s theme, “Built for Speed – Race Inspired Motorcycles and Art,” marks the sixth year in a row that the annual Buffalo Chip exhibit has been curated by famed motorcycle photographer, Michael Lichter, and the second year with the Vintagent’s Paul d’Orleans. Together, they will show you the connections between motorcycle racing and custom bike designs inspired by racers with this impressive display, Saturday, Aug. 2 through Friday, Aug. 9. The purity of purpose in the “Cut-downs” of the 1920s, “Bob-jobs” of the ‘30s, Café Racers of the ‘50s, “Drag-bike” choppers of the ‘60s, and “Street Trackers” of the ‘70s has had enduring appeal with customizers today. This display will guide you through both the original racers and the beautifully crafted custom bikes taking inspiration from them. Each custom bike in the Built for Speed Exhibition reflects a different branch of racing: Speedway, Flat Track, Drag Racing, Board Track, Grand Prix and Land Speed Record. Race-themed painting, photography and prints by artists equally inspired by competition motorcycles will adorn the walls surrounding these amazing machines, in addition to an all new “21 Helmets” display from SeeSee Motor-Coffee in Portland. The 35 motorcycles in Built for Speed include customs by long established and emerging builders, side by side with factory-loaned machines. For more information, go to www.buffalochip.com. Tin Lizzie Casino is proud to partner with Lucas Oil Products to present Lucas Roadhouse, August 3-7! 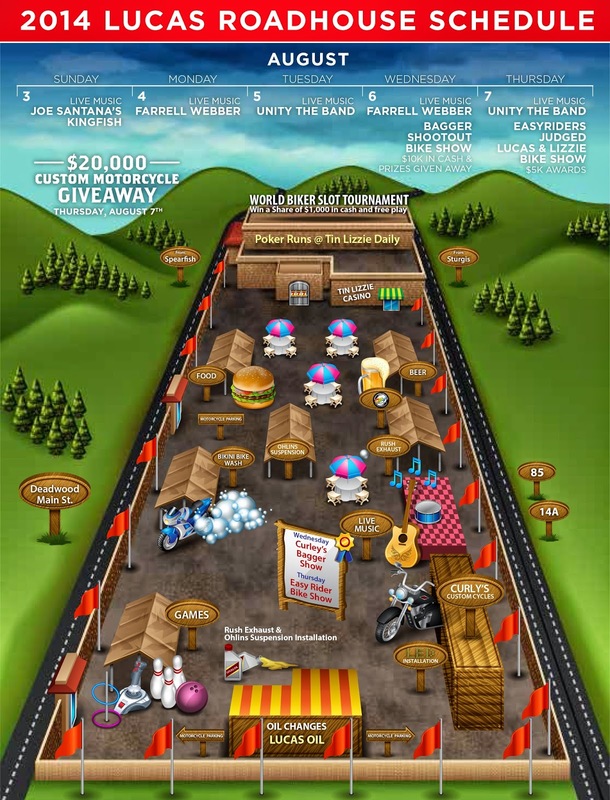 Bigger than ever, this annual event held at 555 Main Street in Deadwood, South Dakota, complements the excitement of the Sturgis Motorcycle Rally with a parking lot party featuring over $50,000 in Cash and Prizes, poker run, bike shows amazing custom motorcycle giveaway and much more! A pair of premier bike shows will showcase something for everybody who loves two wheels! Deadwood’s Nastiest Bagger Shootout on Wednesday, August 6th, presented by Curly’s Custom Cycles and John Shope’s Dirty Bird Concepts, awards $10,000 in Cash and Prizes. Then, the Lucas & Lizzie “Show, Shine & Win” Bike Show on Thursday, August 7th , judged by Easyriders magazine staff, offers a $5,000 prize purse, class trophies, and possible feature of winning bikes in a Paisano Publication Magazine. On Thursday, August 7th at 4:45 pm, the winning name will be drawn for the Lucas & Lizzie Custom Motorcycle Giveaway ! Entry tickets for this one-of-a-kind bike, valued at $20,000 and built by JR’s Contraptions, are FREE at the on-site Lucas Oil Changing Station, any poker run stop, and the Tin Lizzie’s Players Club! Poker Run participants play for $16,000 in prizes, including products from nationally recognized brands such as Ohlins, Rush Racing Products, and Cycle Solutions, Inc., and three much coveted 5- night stay packages at local establishments during the 75th Anniversary of the Sturgis Motorcycle Rally in 2015! Other highlights of the Roadhouse include bikini bike washes, food and beer gardens, and live music daily from 12-6pm with rockers Joe Santana and Kingfish on August 3rd, original roots reggae group Unity the Band on August 5th and 7th, and the rock and roll tributes of Farell Webber on August 4th and 6th! Plus, be a pioneer in the first ever World Biker Slot Tournament, August 3-8, and win a share of $1,000 and bragging rights with the custom WBST Championship Belt! So, mark your calendar for this 5 day event and roar into Tin Lizzie when the Lucas & Lizzie Roadhouse becomes a magnet for everything motorcycles! While not for sale, Project LiveWire is specifically designed for the purpose of getting insight into rider expectations of an electric Harley-Davidson motorcycle. Harley-Davidson Motor Company produces heavyweight custom, cruiser and touring motorcycles and offers a complete line of Harley-Davidson motorcycle parts, accessories, riding gear and apparel, and general merchandise. For more information, visit Harley-Davidson’s website at www.h-d.com.